The Disney musical tells story of "true love, who we really are, what really matters"
Performers promote the show during an assembly in the gym. 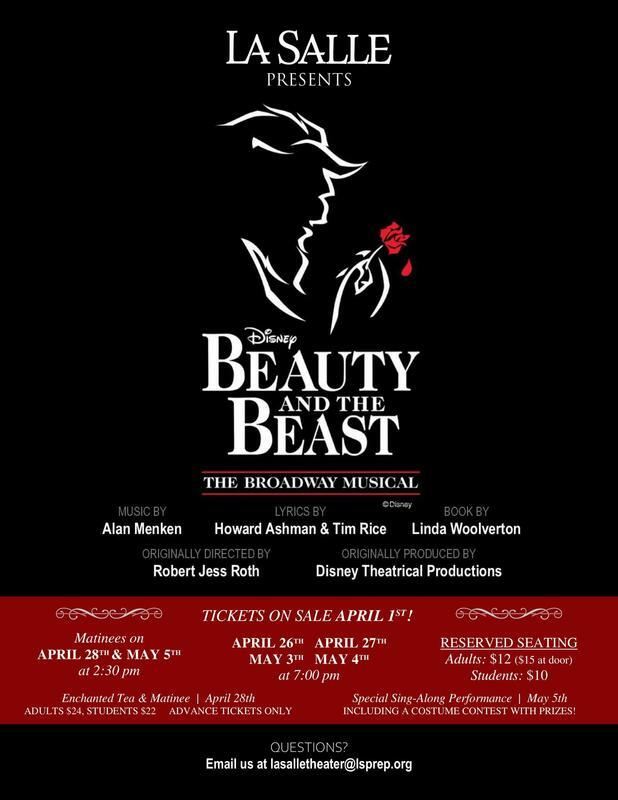 La Salle Prep Theater will perform Disney's Beauty and the Beast for two weekends this spring. "We are humbled and thrilled to have the chance to bring this story to the La Salle stage," said artistic director Michael Shelton. "Beauty and the Beast is a delightful, meaningful story about true love, who we really are, what really matters." April 26, 27 and May 3 and 4 shows will start at 7 pm. The April 28 and May 5 matinees will start at 2:30 pm. Music teacher Otto Wild directs the vocals and band director John Donnelly conducts the orchestra, which is made up of student and professional musicians. 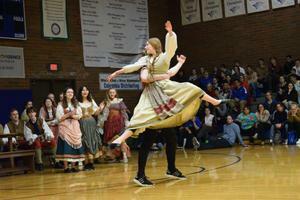 Performers gave the La Salle community a sneak peek of the show during a recent assembly. The show will feature extravagant costumes, many of which were rented from Westview High School in Beaverton, the first high school in the country to perform Beauty and the Beast when rights were first made available to the public nearly 20 years ago. "Costumes are hugely important to this show," said Shelton. "It's a Disney show about magic and love and enchanted castles. There is a LOT of specific, story-driven detail which needs to go into the costumes to allow for functionality within the story. "For instance," he said, "the Wardrobe (Madame Grand de la Bouche) not only needs to look like a wardrobe, and she needs to have dresser drawers which open and close as well as space within the drawers to store costumes which she can pull out and offer to Belle all while still maintaining movement and flexibility for the actor." 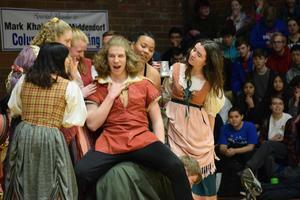 The show is being staged by dozens of student actors, directors, crew members, and musicians with the support of a team of teachers, parent volunteers, and professionals. "Here at La Salle we are blessed with talented and dedicated students who have poured themselves into this production," said Shelton. "I think the audience is going to be struck by the quality of the student designers and performers in this show." In addition to the two-weekend run, there will be an "Enchanted Tea" party at 12:30 pm before the first Sunday matinee and an audience sing-along and costume party during the final matinee. Also, audience members at all shows can try to win prizes by jotting down in their programs the surprises they spot in the production. April 28 Enchanted Tea Party - 12:30 pm in cafeteria. Buy tea ticket when buying a show ticket. 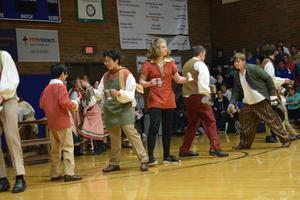 The tea will feature music, food, crafts, face painting, and a chance to meet the characters. May 5 Costume Party/Sing-along - during intermission on stage. Included with admission. During intermission, audience members in the best costumes will be invited onstage and given prizes. All Shows Spot and Jot Contest - Included with admission. Audience members can try to win prizes by spotting and jotting in their programs the surprises they see in show.